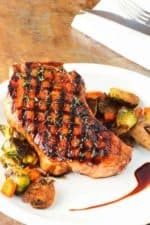 This Balsamic Grilled Pork Chops recipe is just so delicious; especially if you make it with roasted glazed Brussels sprouts and carrots. We love getting nice thick center cut pork chops, and starting them off on a hot grill, then transferring to an oven to finish the cooking. Amazing! And, we absolutely love using my Cast Iron Grill Iron for making these chops. When you can’t get out to your outside grill, this work-horse does the job perfectly every single time. They are so easy to order, too, not to mention they are super durable and very affordable. Check it out by clicking below! Just look at that chop! Delicious! A good quality balsamic is just heavenly, and when you make a nice reduction, it makes for the perfect glaze. Pure maple syrup takes this over the top. The roasted veggies call for a similar balsamic sauce for baking. Perfection! Okay! 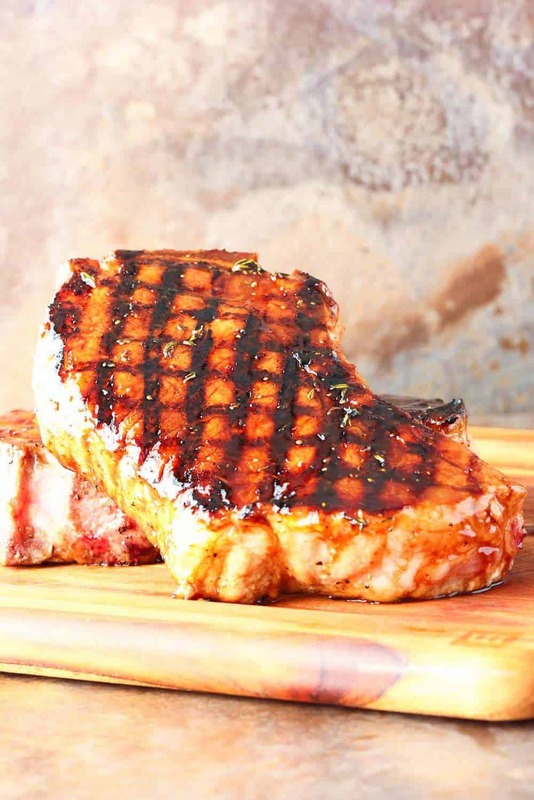 I think it’s time to make this amazing Balsamic Grilled Pork Chops recipe! And let’s do some roasted glazed Brussls sprouts and carrots, too! Why not? 140% Loon Approved! 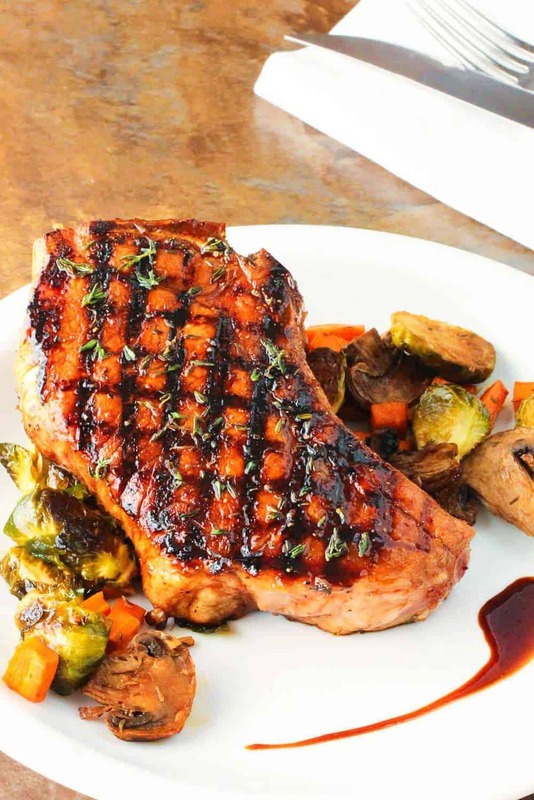 This Balsamic Grilled Pork Chops recipe is just through-the-roof delicious. Start the chops off on the grill and finish them up in the oven. And bake some incredible Brussels sprouts and carrots with the sauce, too. 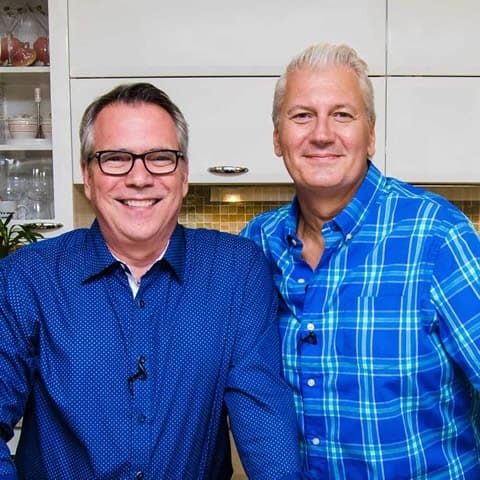 Both recipes are included! Woo hoo! Generously season the chops with salt and pepper and let sit at room temperature for 30 minutes before grilling. Mix together balsamic vinegar and maple syrup in a small sauce pan and cook over medium heat until thickens and reduces to about 1/4 cup, about 15 to 20 minutes. Stir in butter and thyme. 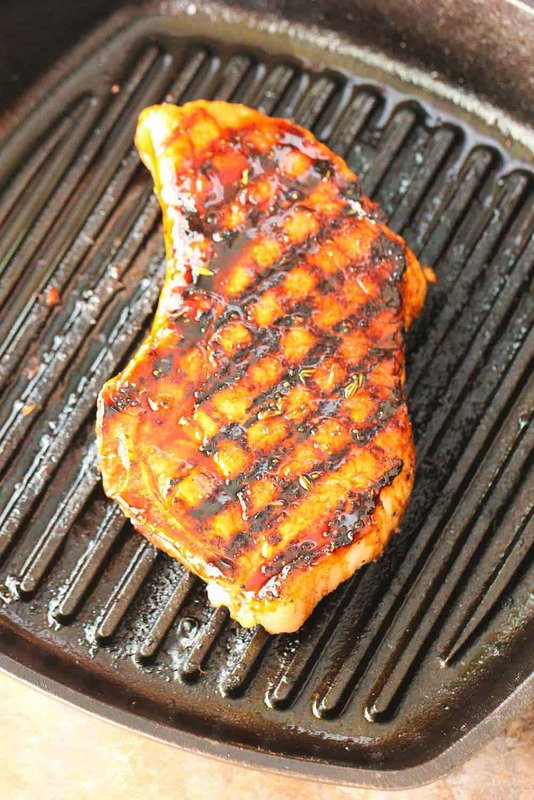 One grill is good and hot, place chops on the grates and brush on some of the balsamic reduction. Grill for about 6 to 8 minutes and then turn, basting again and cooking for another 6 to 8 minutes. Place grilled chops on a baking sheet and bake until cooked through to 145°F, about 15 to 20 minutes. 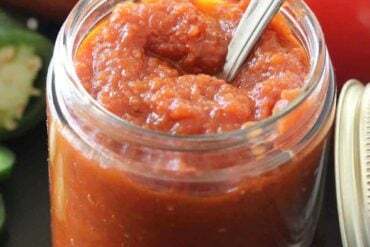 In a small bowl, whisk together the vinegar, olive oil, and maple syrup Set aside. Place Brussels sprouts and carrots on the prepared baking sheets and pour the balsamic mixture over it, topping with the chopped thyme, garlic and healthy pinches of salt and pepper. Place in oven a bake until brown and tender, about 25 minutes. Serve immediately with pork chops.